Dr. Koscheski graduated the medical school from the Saint Louis University and did his internship at the Virginia Mason Medical Center. He completed his residency program at the Harbor-UCLA Medical Center and is now specialized in Radiology. Dr. Koscheskiis board certified in Diagnostic Radiology and also licensed to practice medicine in California and Florida. 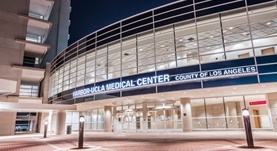 He is currently affiliated with the Harbor-UCLA Medical Center.